Melissa Schiffel is sworn in as Delaware County prosecutor by Carol O’Brien, who previously held the office before resigning in February to take a position at the Ohio Attorney General’s Office. After being sworn in, Schiffel thanked her family, including her husband, Nate (left), and their daughter, Perri (bottom left). 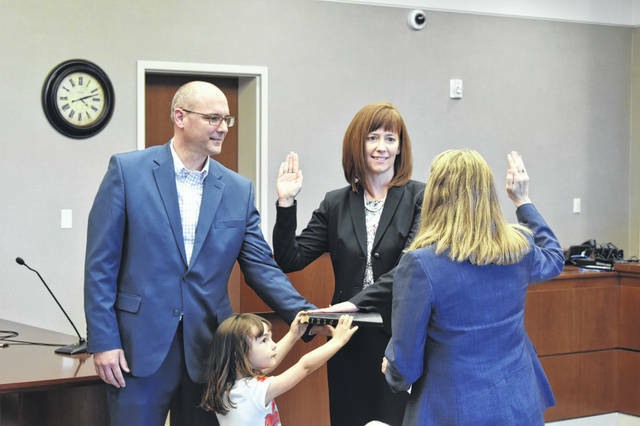 After being chosen as the new Delaware County prosecutor on Thursday by the Delaware County Republican Party Central Committee, Melissa Schiffel was sworn in to her new position on Friday. Schiffel replaces Carol O’Brien, who departed the office in February to take a position at the Ohio Attorney General’s Office and Christopher Betts, the civil division prosecutor who had been serving as acting-county prosecutor since O’Brien’s departure. O’Brien swore Schiffel in Friday afternoon in Judge James P. Schuck’s courtroom. O’Brien said she was “honored” to hand the job to Schiffel, adding that years ago, she knew Schiffel would be the next county prosecutor. Schiffel was sworn in with the help of her husband, Nate, and their daughter, Perri. Schiffel thanked her family, and she added Perri is the reason she wanted to be a prosecutor. “I want to fight for our children and make this community the safest and best for them,” Schiffel said. After Schiffel was sworn in, Betts gave her the county prosecutor badge. The new county prosecutor then took a moment to swear in the all the assistant prosecutors at the prosecutor’s office. Before coming to the Delaware County Prosecutor’s Office, Schiffel served as a prosecutor in the city of Delaware, a prosecutor in Fairfield County, and as an assistant attorney general for the state. The prosecutor’s office reports Schiffel grew up in Central Ohio and graduated from Dublin Coffman High School. She went on to attend Ohio University and Ohio Northern University, College of Law. The office reports Schiffel has prosecuted hundreds of felony cases and has experience in management and leading public offices. She has been prosecuting cases for more than 10 years.